The summit of Eaglecrest Ski Area, Alaska. Photo courtesy of Eaglecrest Ski Area. 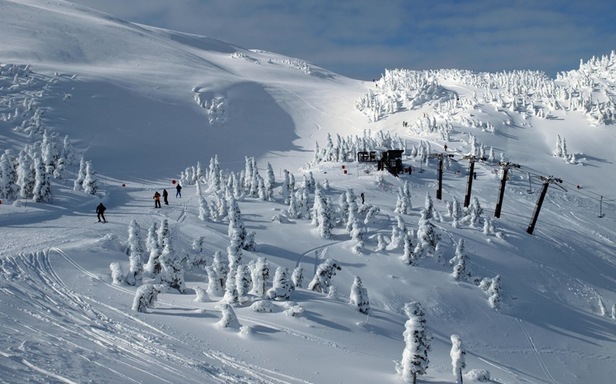 Eaglecrest, with its uncrowded slopes and breathtaking Alaskan views, takes home the 2013 OnTheSnow Visitors' Choice Award for the Best Family Resort in the Northwest. A two-hour flight north of Seattle, Eaglecrest is located on Douglas Island. The 640 acres and 36 runs, served by four double chairs, offer everything from easy, wide trails to challenging chutes. Lifts operate Thursdays through Mondays from December to April; full time over holidays. Ski lessons are available for all ability levels. All of the area's lodging is within walking distance to the ski area. There are also eight hotels with 650 rooms in Juneau and a bus service to the ski area on weekends and holidays only. Food is served at the Base Lodge and includes homemade soups, sandwiches and espresso. Restaurants and bars can be found in downtown Juneau as well.